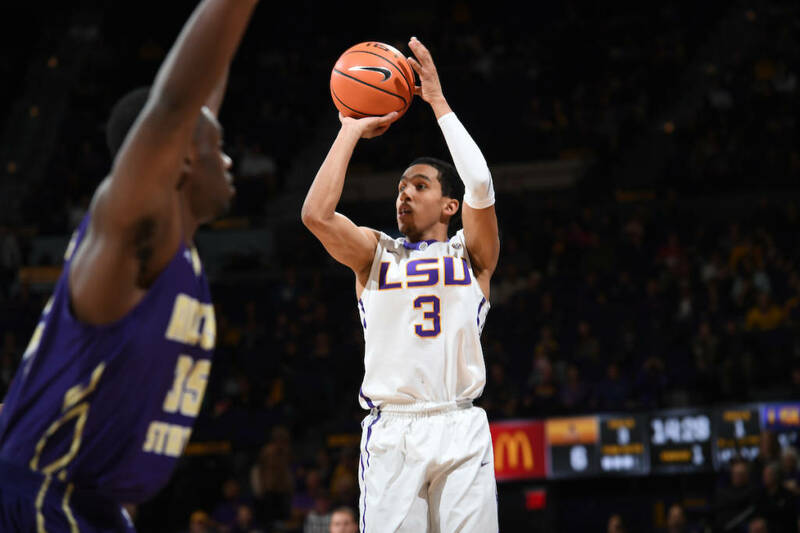 LSU freshman guard Tremont Waters erupted for 27 points and 11 assists in this past Saturday’s win over Arkansas. Published on Wednesday, 2/7/18, at 9:25 a.m. Eastern. Updated on Wednesday, 2/7/18, at 5:40 p.m. Eastern. Before getting to a bunch of news and notes from across the nation, let’s start with my Florida Gators. Mike White’s team is mired in a 1-3 slump both straight up and against the spread and is in dire need of a victory tonight. UF hosts LSU at 6:30 p.m. Eastern on the SEC Network. As of early this morning, most books had the Gators installed as a eight-point favorites with a total of 148.5. The Tigers were +295 on the money line (risk $100 to win $295). By mid-afternoon, the line had moved up to nine with the tally down to 147.5 points. LSU is 3-3 both SU and ATS in six road assignments, while UF is 9-4 SU and 5-7 ATS at home. Tremont Waters, LSU’s star freshman point guard who was a 4-star signee, was sensational against the Hogs. He dropped 27 points and dished out 11 assists. Waters paces LSU in scoring (15.3 points per game), assists (5.8 APG) and steals (2.2 SPG). After Saturday’s embarrassing loss at home vs. Alabama in front of a sold-out O’Dome, UF is only No. 38 at KenPom.com and is way down to No. 46 in the RPI. Before any of the orange and blue faithful fret too much about those numbers, remember that the Gators don’t have any losses outside of the RPI Top 100 and they own seven Top-50 scalps. Most important, five of those seven Top-50 wins have been on the road (3) or on a neutral floor. The win at Prudential Center in Newark over Cincinnati is aging extremely well, as the Bearcats are up to No. 11 in the RPI and No. 4 at KenPom. Florida is led by senior point guard Chris Chiozza, who is better known in Gainesville as ‘Cheez.’ On that note, it’s Cheez Night at The O’Dome with the first 1,000 fans in the arena getting orange cheese heads and the first 2,000 being issued cheese shirts. For more on LSU at UF, check out long-time UF beat writer Chris Harry’s preview here. You can also check out my latest piece on tonight’s card over at VegasInsider.com, including previews of Ohio St. at Purdue and Texas A&M at Auburn. –Colorado guard Namon Wright is ‘questionable’ for tonight’s home game vs. Utah with an unspecified illness. Wright is averaging 11.1 points and 4.0 rebounds per game. The Buffaloes, who are 9-2 SU and 8-2 ATS at home this season, were 10-point favorites early this morning. The total was a 135.5 points. The ‘under’ is on a 7-1 run for Cal in its last eight contests. –Illinois St. guard Keyshawn Evans will miss at least one week, possibly two or three, with a knee injury. Evans is averaging 15.6 points, 3.4 assists and 2.8 rebounds per game. –The ‘under’ is 15-5 overall for Virginia. The Cavaliers are at FSU tonight as three-point home favorites with a total of 131. This is the Seminoles’ lowest total of the season. In fact, they’ve only had one total in the 130s and that game went ‘over’ in a 101-90 overtime win over Syracuse. However, the game was already ‘over’ the 137.5 points with 148 combined at the end of regulation. As for UVA, it has seen the ‘under’ go 7-1 in its eight games that had totals in the 130s. Also, the Cavs have seen 12 of their past 13 games produced 130 combined points or fewer (much fewer in most instances). –SMU’s Shake Milton is ‘out’ indefinitely with a hand injury. This is a huge blow to the Mustangs, who are No. 70 in the RPI going into Thursday’s crucial game at Houston. Milton is averaging 18.0 points, 4.7 rebounds, 4.4 assists and 1.4 steals per game. –St. Bonaventure star guard Jaylen Adams has been upgraded to ‘probable’ tonight vs. Saint Louis due to an illness. Adams averages 18.5 points, 5.2 assists, 4.0 rebounds & 1.3 steals per game. The Bonnies are six-point home favorites. –UC Santa Barbara has suspended forward Jalen Canty indefinitely. Canty was averaging 12.9 points, 7.8 rebounds and 2.0 blocked shots per game. –Georgia has seen the ‘under’ go 10-1 in its past 11 games. The lone ‘over’ appeared in an 80-77 double-overtime home loss to Arkansas when the game was still ‘under’ the 145-point total at the end of the first OT (69-69 for 138 combined pts.). Furthermore, the ‘under’ has cashed in all nine of UGA’s road assignments. Mark Fox’s team is at Vanderbilt tonight as a 3.5-point underdog. The total in around 132. After a deplorable 1-14 start ATS, the Commodores are 4-1 ATS in their past five games. The lone non-cover came in Saturday’s 12-point loss at Auburn as 11.5-point puppies. –After last night’s home loss to Nebraska, I can’t see Minnesota’s Richard Pitino dodging a pink slip at the end of this season. The Cornhuskers lead the nation in spread covers (18) and are on a 13-1 ATS tear in their last 14 outings. They beat the Gophers as 3.5-point underdogs, hooking up money-line supporters with a payout in the +160 range.Tim Miles’s team is only No. 53 in the RPI and No. 57 at KenPom, but it is on a four-game winning streak with a lot of ‘chalk’ spots left on the schedule to bolster its win total. Plus, Nebraska hasn’t lost to any foe outside of the RPI Top 100. —Check out tonight’s televised games here. —Best of luck with your wagers!